The adrenal glands are paired endocrine glands found on top of the kidneys. They are composed of an inner medulla and an outer cortex, which is in turn divided into three zones. The zona reticularis is the innermost layer of the adrenal cortex. It is responsible for production and secretion of androgens. The zona reticularis is the innermost layer of the adrenal cortex, lying just above the adrenal medulla. It comprises of cylindrical masses of epithelia arranged in an irregular, net-like pattern. In comparison to the zona fasciculata the cells contain fewer vacuoles as well as appearing more irregular and smaller in size. 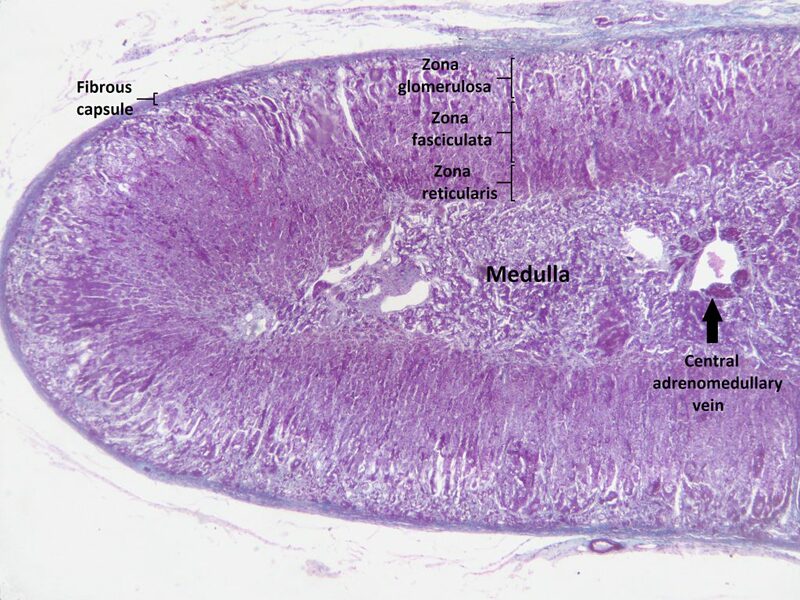 Fig 1 – Histology of the adrenal gland. The zona reticularis is the site of biosynthesis of androgen precursors such as dehydroepiandrosterone (DHEA) and androstenedione from cholesterol. These androgens are released into the bloodstream and transported to gonads where they are converted into testosterone or oestrogen. These are largely responsible for the normal development of sexual characteristics during puberty. Further information on the effects of adrenal androgens during puberty can be found here. In postmenopausal women, the conversion of adrenal androgens to oestrogen is the only source of oestrogen synthesis and hence is a significant source. 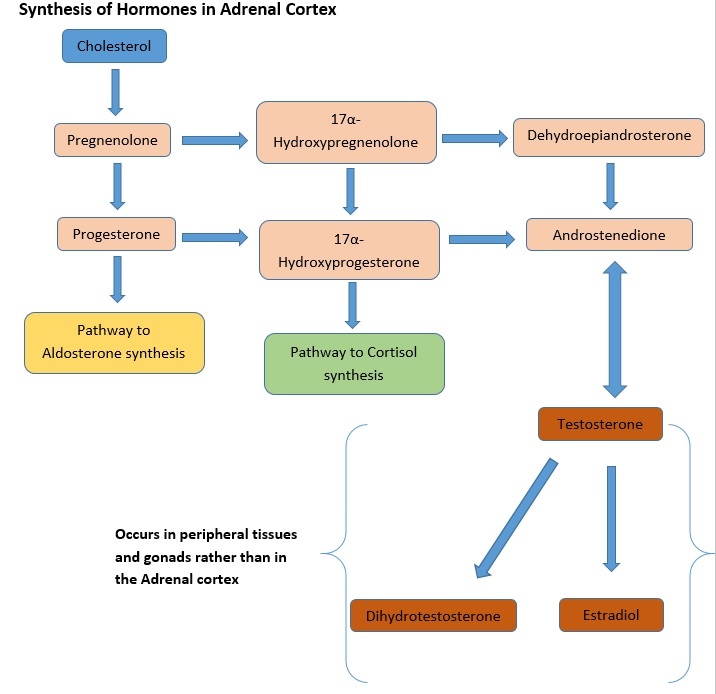 Fig 2 – Diagram showing the production of hormones within the adrenal cortex, focusing on the androgen pathway. Adrenal androgens are regulated by ACTH (adrenocorticotropic hormone) secreted from the anterior pituitary gland which is stimulated by the release of CRH (corticotrophin releasing hormone) from the hypothalamus. However, the adrenal androgens along with their potent metabolites such as testosterone do not negatively feedback to ACTH or CRH. Therefore, in cases where there is a dramatic increase in ACTH, this leads to excess production of androgens which cannot be regulated. Congenital adrenal hyperplasia can result from one of several autosomal recessive diseases in which there is typically a mutation in an enzyme mediating one of the steps necessary in the production of mineralocorticoids or glucocorticoids from cholesterol. This results in a lack of mineralocorticoids and glucocortoids, as well as an excess of testosterone and its derivatives. It may present as a milder form in later life, however in an acute situation, urgent confirmation is needed. Babies born with this will show high levels of testosterone, androstenedione and ACTH. Treatment requires replacement of the missing glucocorticoids and mineralocorticoids, as well of suppression of ACTH. This allows normalisation of the androgen levels. Finally long term follow up is necessary and eventually genetic counselling, as the conditions are inherited. Which layers of the adrenal gland book-end the Zona Reticularis? What is the primary function of the Zona Reticularis? Where are androgens such as DHEA converted to testosterone and oestrogen? What kind of genetic inheritance pattern is demonstrated by Congenital Adrenal Hyperplasia? Which of the following is a common feature of congenital adrenal hyperplasia?